I'd rather waste my taxes this way than send Obama on another vacation. David J. from Tulare, CA signed. 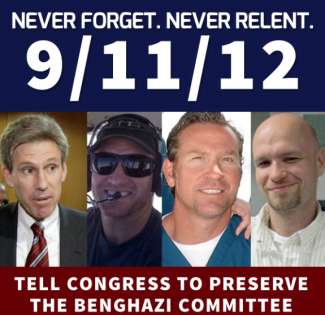 Trey Gowdy and this committee are National Hero's who stand for truth - keep the faith, finish this race! Bruce C. from Willcox, AZ signed. James W. from Arlington, TX signed. William W. from Calico Rock, AR signed. Charlotte S. from Chicago, IL signed. Margaret S. from Austin, TX signed. Claudia O. from Cincinnati, OH signed. Ellis V. from Toledo, OH signed. Patricia R. from Bronx, NY signed. Kevin H. from Fairmont, WV signed. Brian R. P. from Minneapolis, MN signed. Despite Kevin McCarthy's blatant ignorance about the purpose of the BENGHAZI committee, the families of the victims are entitled to the truth. Let Gowdy do his job! Cheryl V. from Castle Rock, CO signed. John R. from Gresham, OR signed. Jana W. from Houston, TX signed. Sylvia F. from Santa Maria, CA signed. Ron B. from Dallas, TX signed. Peter W. from Dallas, TX signed. Killary is guilty of many crimes, DO NOT let the investigation be shut down. Richard F. from Cottonwood, AZ signed. Ramona H. from Irving, TX signed. James R. from Bend, OR signed.